I had a delightful dinner at Opus Restaurant in Birmingham. It was clearly the hot spot for the evening. 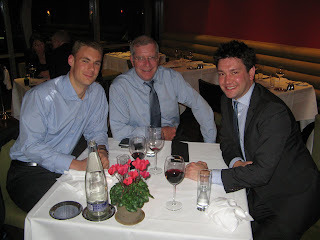 I was joined by Ben Thornton and Scott Dodsworth from the FH London office. At the next table was Shadow Chancellor of the Exchequer, George Osborne, who gave a firey speech a the convention earlier in the day. He mocked Gordon Brown over his economic policies, which are showing the same signs as the banking collapse in the U.S. The conversation at our table was lively. We concluded that Western civilization is doomed. Time to learn Mandarin.